Volunteering, working, interested in, or studying the environmental sector? Join us! 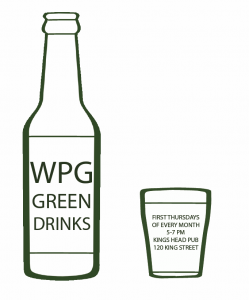 Manitoba Eco-Network proudly hosts Green Drinks Winnipeg every first Thursday of the month at the King’s Head Pub (120 King Street) from 5-7 PM. Come by for an informal get-together of after-work bevvies and feel free forward this invitation to friends and colleagues! Contact info@mbeconetwork.org for more info, or visit our Facebook event page. 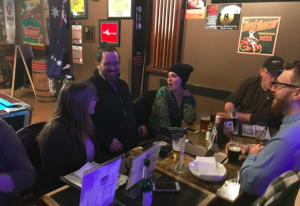 Every month people involved in the environmental sector meet up at networking sessions known as Green Drinks (greendrinks.org) across the world. We have a lively mixture of people from NGOs, academia, government and business. Come along and you’ll be made welcome. Just say, “are you green?” and we will look after you and introduce you to whoever is there. It’s a great way of catching up with people you know and also for making new contacts. Everyone invites someone else along, so there’s always a different crowd, making Green Drinks an organic, self-organizing network. These events are very simple and unstructured, but many people have found employment, made friends, developed new ideas, done deals and had moments of serendipity. It’s a force for the good and we’d like to help it spread to other cities. Blue Drinks is a spin off of Green Drinks that creates space for people to discuss water issues. For more information visit the Facebook event page.